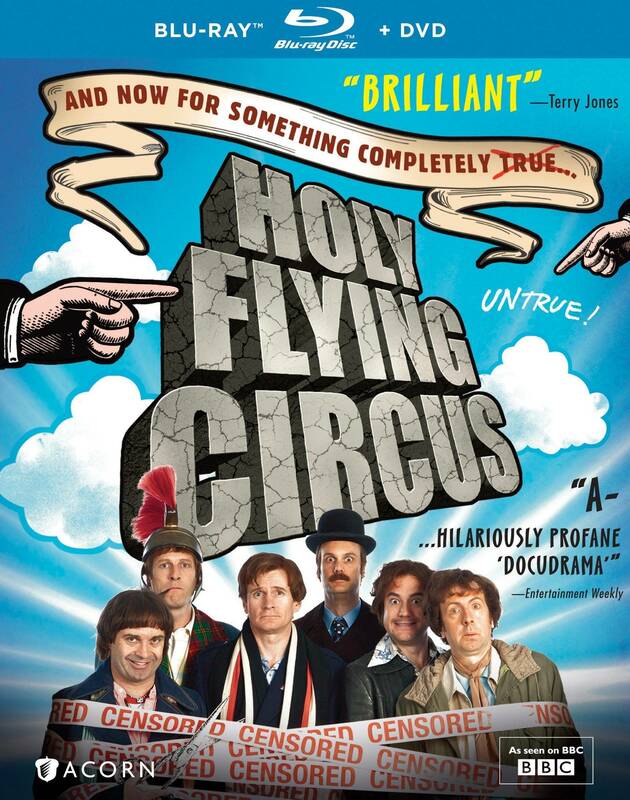 A wildly inconsistent but generally enjoyable docudrama about the controversy surrounding Monty Python’s Life of Brian, Holy Flying Circus overcomes its schizophrenia by embracing it wholeheartedly. Originally aired on BBC4 in 2011, this thing is a hodgepodge of faithful fictionalization, meta asides, surreal interjections, impressions of varying quality and irreverent humor. In other words, it’s like a docudrama as produced by the Pythons themselves, even if writer Tony Roche can’t really hold a candle to the Pythons’ brand of inspired lunacy and never achieves the blistering specificity of the satire of In the Loop, which he co-wrote. In a lot of ways, Holy Flying Circus coasts by on any given viewer’s goodwill for Monty Python. If, like me, you’re a Python fan and think Life of Brian is their masterpiece, there’s a good chance you’ll have a ball witnessing this re-creation of its controversy — one that’s not strictly moored to fact. If not, well, there’s likely little reason you’ll seek this out, so Roche and company are playing well to their audience. Picking up just after Life of Brian was completed and greeted with a disastrous reception in the United States, Holy Flying Circus chronicles the widespread effort in Britain to have the film banned before it was even seen and the eventual appearance of John Cleese and Michael Palin on chat show Friday Night, Saturday Morning to defend their film against a bishop and cultural critic Malcolm Muggeridge. The film’s third act is quite good, offering up a fairly faithful re-creation of the heated talk show debate without simply turning into a stuffy facsimile (a sequence featuring Palin’s bloody fantasy ensures that). It’s not always as sure-footed getting there though, spending far too much time in the BBC2 offices of the chat show and following around a group of protestors determined to get the film banned — a reworking of characters from Life of Brian that doesn’t really work. Fortunately, most of the in-jokes keep the film engaging throughout, from the subtler call-backs to shots from Life of Brian to Python-like multiple roles played by all the principals. In an obvious but still rather funny inside bit, the actor who plays Terry Jones (Rufus Jones) also plays Palin’s wife as the archetypal mannish Terry Jones woman. Speaking of the cast, Steve Punt is a dead ringer for Eric Idle and Charles Edwards is perfect in his portrayal of Palin both physically and in his gentle, thoughtful demeanor. Darren Boyd may not look much like John Cleese, but he nails the voice and speaking cadence. Jones as Jones and Tom Fisher’s Graham Chapman are decent, but it’s probably best to say as little about Phil Nichol’s rendition of Terry Gilliam as possible. In the midst of its careening and inconsistent structure, Holy Flying Circus finds a surprisingly emotionally affecting core in Edwards' Palin, who becomes the focal point of the film about halfway through. It may seem counterintuitive, but in this film about the Pythons, it may be the pathos that ultimately stands out in the end. Holy Flying Circus is presented in 1080i high definition and an undetermined widescreen ratio that looks to be around 1.95:1. Despite being interlaced, the transfer has no major defects, presenting a sharp and clean transfer that faithfully renders the slightly muted 1970s-style color palette. The 2.0 PCM stereo soundtrack is just fine, rendering the dialogue perfectly clean and clear. Unfortunately, aside from the brief pull-quote of “Brilliant” from Terry Jones on the front cover, there are no contributions from the actual Pythons to be found here. A couple deleted scenes, a 20-minute outtake reel, a brief making-of of the opening credits and a stills gallery are all pretty negligible. The set also includes a DVD copy of the film and extras. While I can’t agree with Jones that Holy Flying Circus is brilliant, it’s still pretty fun for Python fans, although digging out the archival video of the actual talk show visit and then watching Life of Brian again would be even better.